Join us at the Beginning Investors Group on Monday, July 17th at 6:30PM at the Hudson Grille located at 6317 Roswell Rd in Sandy Springs, GA, with Chris and Donna Littleton, who will show you how they built a rental portfolio that pays for their daughters college and will be a solid source of income in their retirement years. Just as important as learning how to do it right, is knowing how NOT to do it. 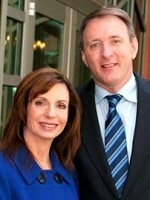 Chris & Donna will share their setbacks as well as their triumphs. When it comes to making money as a real estate investor, you must understand real estate trends and have multiple strategies – including a plan to generate income you receive without having to show up! How they got their first rental with extremely limited resources. The “Too good to be true” deal that almost broke them. Proven Methods the Littleton’s use to acquire Rental Properties. Essentials – You don’t need to be an expert, just know what you don’t know! Why NOW is the Time to Own Rental Properties – Trends in the Market. Don’t miss out on this great opportunity to get started on the path to PASSIVE INCOME!